So, we all want our picture to look just right on our driver’s license, and Sean Corbett is no different. He has struggled for years to get his driver’s license photo looking just how he had always imagined it. 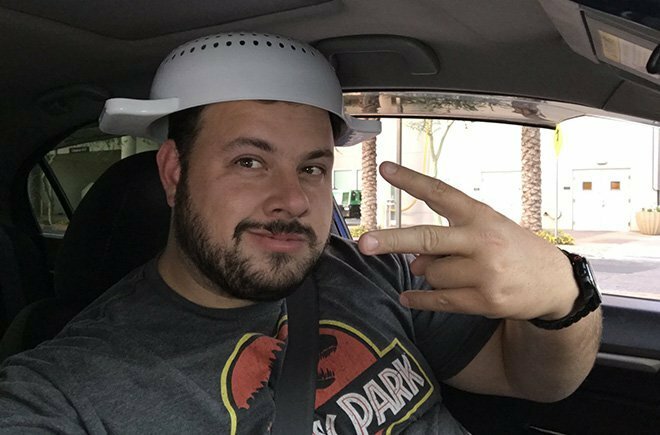 But now, Corbett, who is 36 years old and from Chandler, Arizona, has just had his wish granted and he is finally in possession of an Arizona driver’s license that displays the photo of him wearing a colander on his head. Yes, that’s right; a spaghetti strainer! On his head! Now, you might think this all sounds a little strange. But in 2014, Corbett discovered the Church of the Flying Spaghetti Monster, which promotes Pastafarianism among its followers. The religion, which was founded in 2005, was created to promote freedom of religion and religious expression, as well as to criticize some of the religious teachings in schools. Pastafarians believe the idea that the world was created by a Flying Spaghetti Monster, thousands of years ago. According to Corbett, when speaking to USA Today, the Church of the Flying Spaghetti Monster highlights that all religions should be equally regarded, and that one religion shouldn’t be more important or acceptable than the other. So, his wearing of the colander was a demonstration of his religious beliefs, with him making a point that he shouldn’t be persecuted because of his Pastafarian religion. 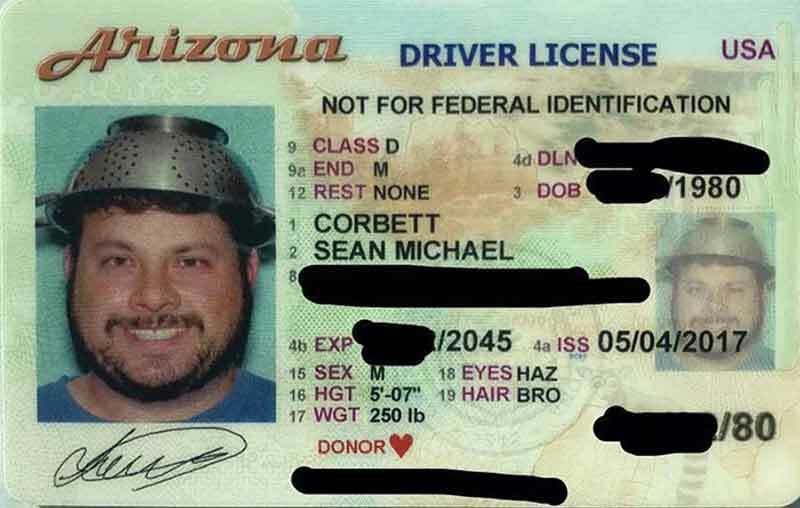 Corbett has been trying – and until now, unsuccessfully – to have his MVD license photo taken with the spaghetti strainer on his head since 2014. He was refused countless times, despite visiting different MVD locations. The various MVD locations were often rejecting him at the door, having been notified by the other departments that he might be heading their way. Now that he has finally been able to get his driver’s license photo just the way he wants, the Arizona Department of Transportation is said to be invalidating his license, because of the photo. Photos for driver’s licenses are often supposed to be free of any large accessories, such as a hat, but there are sometimes exceptions for religious reasons. If the MVD eventually do void Corbett’s license, he plans to fight it, to stand up for his religious rights, as well as the rights of other religions, by taking legal action against the Arizona officials. To keep up to date with Sean Corbett, you can follow him directly on Twitter and keep an eye on the life of that license.